According to this morning's paper, my newly acquired home state ranks 5th....5th! in the nation for obesity. We're tied with Tennessee and lag behind number one ranked Mississippi, #2 West Virginia, #3 Alabama, and #4 Louisiana. Hmmmm....trend much? Doesn't say much for that down home cookin' now does it? So let's recap shall we? I am raising my children in a place that ranks 48th for quality of education, 13th for human lightning strikes, and 5th for obesity. Did anyone just here the audible gulp!? And no, that was not the sound of southern fried chicken goin' down the pipe. I might live in Cackalackie, but I'll take a New York "slice" or a California "wrap" over southern fare any day. I guess if the home sickness doesn't kill me, lightning or fried chicken will. 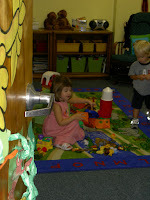 Here are some snapshots of Emma's first pick up from school. I mostly took video when I went to pick her up, so I only got 4 shots with the camera. She was clearly getting tired of all the fuss, and I had to make room for all the other flashing cameras and their respective parents. 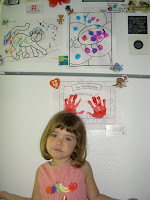 Proudly displaying her first bit of art work from school and standing next to her backpack hook. Notice that she's not looking at the camera at all! At this point, I'd already taken about 15 minutes of video of her reaction when I came to pick her up, and she was DONE with cameras. I think her words were something like, "C'mon mom! I'm thirsty. We gotta' go get me somethin' to drink! No more pictures, puuuhhlleeeeeeease." I should mention that when Emma first saw me walk in her classroom, she came running over saying, "I made somethin' for you mommy!" which is when I was handed her art work from the day. As soon as we walked in the door at home, she announced, "We're gonna' put it on the 'fridgerador', right?!?" "Of course baby. I would be honored." I happened to get a few shots of her in action while I was there as well. These were taken when we dropped her off, and as you can see, there was no love lost when it was time to leave mommy and daddy and get on with the day. She jumped right in with two feet and never looked back. That's my girl! 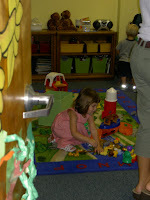 The teacher had set out some toys on the rug so the kids would feel welcome and ready to have fun. Emma didn't miss a beat on that one. Miss Marie then asked her to come sit down and paint her ladybug which, if you look back at the "fridgerador" pictures, you'll see displayed directly above the handprints art work. The blonde woman in the front is Emma's teacher Miss Keri, and Emma absolutely LOVES her! She's been talking about her all day. All in all, she had a great first day at school and is in bed as I type, singing a newly memorized song about monkeys swinging in a tree teasing Mr. Alligator, saying, "Can't get me." I'm sure you can guess how it ends. My little monkey is growin' up. Nite nites Emma. Until tomorrow's adventures. I love you. 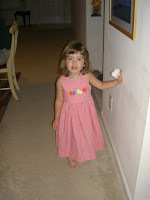 Having finished breakfast, she went upstairs to brush teeth and put her shoes on. 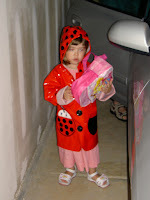 Afterwards, Emma found her raincoat (because of course it was pouring this morning) and backpack and waited in the garage for her turn to get in the car. 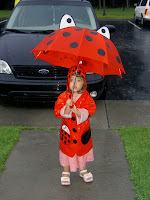 Armed with her ladybug umbrella, Emma waited patiently to go inside. Once in, she RAN...literally to her classroom, Nicky "egging" her on the whole way! And here's Emma running into the arms of her new teacher! She was so happy to finally be a big girl at school. And mommy cried the whole way home. We love you Emma. Have a wonderful day! Fall is coming. I can feel it in the subtle breeze that lifts the hairs on the back of my neck, reminding me to dig out those musty sweaters that I've stashed in a box somewhere at the back of my closet. I can see it in the all too eager leaves that have jumped the gun, already littering my backyard with their warm splashes of color. And I can taste it in the fall fruits, neatly displayed in rows in the produce aisles. Fall is coming. 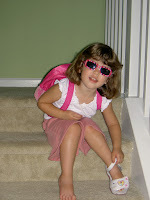 And while it is usually my favorite time of year, this year the season brings with it just a hint of bittersweetness as my beautiful daughter takes her first steps in growing up and away from me....she's going off to school. She has picked out her new backpack (which she insisted must be "princesses" of course), we've ironed her dress, cleaned up her princess sandals, and put together her school supplies (which at her age amount to a change of clothes, a box of tissues, baby wipes, paper towels, and a disposable camera). She is all ready and so excited that she's practically bursting. She's been asking...no begging me to go to school ever since the first day she saw the school bus drive by her bedroom window carrying a load of giddy, giggling children. "Mommy, what's that?!?" she asked me with a sense of wonderment that can only come from the mouths of children. "Yup. It's the bus that takes the children to school." She looked wistfully out the window for a few moments as the bus's diesel engines hummed by our house, leaving a billowing cloud of kicked up grass clippings and leaves in its wake. "Mommy. I wan'na ride the schoolbus. 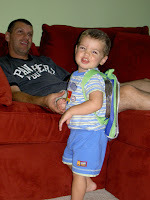 I wan'na go to school right now!" 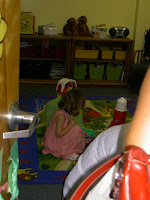 That moment marked the beginning of her fascination with school. It was about 8 or 9 months ago. 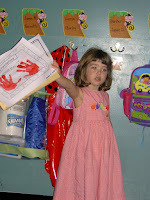 Tomorrow, she will see for herself what school is all about, and admittedly, my heart is breaking just a bit. You see, for all the bitching and complaining I do about the hard part of motherhood, the truth is, I'm a closet romantic. I just hide it well. I mean truthfully, I do miss the working world, and I miss having my independence and the freedom to take off at a moment's notice. And yeah, being a stay-at-home-mom can be incredibly tedious and boring. But at the same time, being home with the kids....it has been my life's blessing. Emma and Nicky are my world. They are my joy, my hope, my motivation, my very heart worn on my sleeve. Having them has changed me completely. They have made me into a kind of person that I never even knew I was capable of being. And while the last three years raising them has had its frustrating, even devastating moments, I would not trade a single, solitary second....because these children are my bliss. 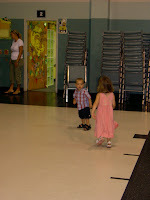 And one of them is about to take her first steps toward independence. I am so proud of her. I am so very proud of the little person she has become. She is sensitive, compassionate, imaginative, caring, VERY sociable, affectionate, strong, able, smart, and clever like a fox. And tomorrow, the rest of the world will get their first taste of the "wrath of Emma". Look out world, here she comes! So, I have the cameras ready (yes, multiple), I have breakfast planned, and the alarm clock is set (not that I"ll need it - she's so excited she'll probably be in my room at 5am asking if it's time yet). But my heart....my heart is not prepared; it is filled with conflict. On the one hand, I could not be more excited for her. She is beaming, and the sight of that makes me, a self-proclaimed cheerleader hater, want to go out and buy a set of pom poms just to cheer her into school. I am her biggest fan, and tomorrow I will be cheering her on, sharing in her joy and excitement. But another part of me doesn't want to come to terms with the hardest part of parenthood - that we love these little people, we raise them with our hearts on our sleeves, in the hopes that they will one day grow away from us and flourish as their own unique person. That is, after all, the point of it all, isn't it? I'll be sure and post some pictures from her first day in the next few....just as soon as I can put the tissues down long enough to type. Having lived in two of America's largest cities, I'm used to reading a big city paper. So, I'm always interested to see what the local small-town paper finds newsworthy. This week, it was a full-page spread on, "Five things you didn't know about lightning but should." Number three was intriguing: "South Carolina is a hot zone. The state ranks 13th in the nation for human lightning strikes." Great. It ranks 48th for quality of education, but 13th for lightning strikes. So basically, as long as we live here, my kids are more likely to be struck by lightning than they are to graduate high school. South Cackalackie: the land of "smiling faces, beautiful places", human lightning rods, and illiterate drop-outs. There's one thing worth noting about the South from May to September, it's hot. The other is that if it's not hot, it's raining. But most days, it's hot and raining, neither of which lend themselves to two small children playing outside. So, lately, the kids and I have been making trips to the local mall (much to my chagrin - I HATE malls) to visit the indoor, air-conditioned play area. It's an excellent opportunity for the kids to get exercise, burn off some energy, play with lots of other kids, and I can sit and enjoy my one vice, fountain sodas. All in all, despite the fact that it's located in the heart of one of my least favorite places, the play area has proven itself to be an invaluable resource. Anyway, this morning we awoke to yet another hot and rainy day (there's a surprise). And Emma having already surmised that rather than play in the backyard today we'd be making our usual trip to the mall, woke me up with her shoes in hand. "Wake up mommy, wake up. It's raining, and we have to go to the mall. You have to get dressed." Ok. My first groggy thought of the day was, "Great. Not only did I get blessed with a daughter who's a morning person (which I am definitely not) that wakes me up at the crack of dawn, but I also got one who looks forward to going to the one place that I loathe. Excellent." Man, when this kid hits her teen years, I hope we can still relate. Anyway, upon her urging, I got up, got dressed, fed the kiddies, and yes, we headed out, in the pouring rain, to the mall. They played for awhile, I drank coffee by myself and watched the other mothers, most of whom relish in the opportunity to sit in their little cliques chatting up the latest stroller advances and diapering trends. And then it was time to go. And of course, when we left, it was STILL raining. Aaaaah....South Cackalackie summers....if they're not hotter than stereo-equipment at the local Mega Pawn, they're wet. And as I said, today was both! So, we made a mad dash for the car, running through 3 inch deep puddles (when you live in a place called the, "Lowcountry," you grow accustomed to deep puddles and drainage issues). When we got to the car, I abruptly told Emma, "Hurry to your side of the car and strap yourself in!" So naturally, she slowly meandered her way around the car, sure to jump in every puddle along the way, and ran her once clean hands over the trunk in amazement of how her fingers left a water trail. Needless to say, this did not make me happy. By the time I finished strapping Nicky in I was soaked, and Emma was just opening her door and was soaked herself. I ran to her side of the car yelling, "Emma get in the car! You're soaked. And now because you took so long, I'm gonna' get more soaked because I have to get you in!" I should explain here that Emma is perfectly capable of getting in the car herself, and that my original plan to cut down on the "soakage", if you will, was to have her get herself in while I strapped in Nicky and then make a mad dash for the driver's seat. Of course things didn't go as planned. When do they ever with two small kids? Anyway, while I was getting Emma strapped in and STILL getting rained on, I was angrily rattling off about how frustrated I was, and how I was upset at Emma for not listening to me in the first place, and how as a result, I was getting wetter and wetter by the minute. And in the course of my rambling, I said a classic "mom-ism". It wasn't my finest example of parenting, but anyone who has kids knows that in those moments when you are frustrated, soaking wet, and slightly angry, things come out of your mouth that not only have no contextual relevance, but are just plain stupid. It went something like this, "Emma, despite what you may think, the world does not revolve around you and your whims." Emma's totally straight faced answer: "Yes it does." I started laughing so hard I almost choked. Leave it to my almost 3 year old daughter to hand me a healthy dose of perspective and levity just when I need it most. She's a bold little thing, and I know she didn't realize why it was funny. But man, I had a good laugh on the way home about that one. And as I drove, I thought, "I should probably notify NASA that the world has taken on a new orbit, and at the center of it is a fiery little star I like to call Emma." How Can I Argue with That?!? Lately, the two kiddos have been trying their hand at that age old game of, "annoy the hell out of my brother/sister and thereby my mother." It goes something like this. Emma takes out a toy, Nicky automatically drops whatever he is engrossed in to go sit practically on top of Emma and touch the toy repeatedly, apparently with no intention of playing with it. Emma responds by screaming and pushing Nicky away and announcing in the MOST annoying whiny voice, "Mommy, he's touching my toy!!! Don't take it Nicky, don't touch it!" Nicky finds all of this amusing. Anyway, this morning the tables were turned as Emma decided to exact some revenge. You see Nicky has recently taken a liking (and liking is too soft a word here) to the play cell phone (and by the way, I still can't believe that there are play cell phones). So, in keeping with the, "annoy the hell out of my brother and thereby my mother," game, Emma went straight up to Nicky and made fake attempts at taking the phone out of his hands. Nicky squealed and promptly pushed her away. Her response, as is usual, was to tattle on him in her most annoying voice, "Maaaawwwmmmmmeeeeeee! Neeecky pushed me!" Oh how I cannot stand that tattling whiny voice she uses. I much prefer her usual, sing songy tone. Anyway, I responded to the situation by reminding Nicky that we don't push people and explaining to Emma that he pushed her because she was bothering him, and that she really needs to stop being a tattle tale and worry about her own behavior. She obviously didn't like what I had to say because within minutes, she went over and pushed Nicky right in front of me, making sure I got an eyeful. I gave her the usual warning, "Emma we do not push people. If I see you do that again, you'll sit in time out. We keep our hands to ourselves. Do not touch Nicky." Her response, "But I love him." Now how can I argue with that? And doesn't that just prove that all those boys and girls that bothered you on the playground when you were little did so because they really DID love you!? !